This is a great young adult novel that's a quick, entertaining read, but also deals with Big Issues--like death, religion, and extremism. I would highly recommend it. Meridian Sozu has always been a bit odd; she seems to attract dead things. Ever since she was a baby, she's been surrounded by dead bugs and animals. No surprise, then, that almost everyone has given her a wide berth, including her family. On Meridian's sixteenth birthday, she witnesses a horrible accident, and her parents panic. They drive her to a bus station and tell her not to attempt to contact them again. Instead, she's supposed to travel on her own to Redemption, Colorado, to meet her great-great aunt. It is there that Meridian learns she's not a freak (or at least, not just a freak). She's a Fenestra, an angel of death that helps souls cross into heaven. But first she has to learn how to do it properly or the souls with take her with them to the other side. Meanwhile, Meridian has to keep an eye out for the Nocti--evil angels that take dying souls to hell and kill Fenestras. This book is a very original twist on the angel myth. I do have to admire the author for taking angels and making them very spiritual beings essential to religion--although not any one particular religion. She also tackles subjects you wouldn't expect to find in YA novel that's as fun to read as this one, namely death. It feels as if everyone and everything dies in this book--animals, kids, old people (not the dog, thank heavens). Like anyone, Meridian has to face the fact that everyone dies and it's a part of life. Being a Fenestra, though, she has to face it earlier than most people do. Even though this sounds depressing, it's actually elegantly handled and winds up being a message of hope. I also liked how the author tied extremism in with the story. In Redemption, a pastor named Perimo has revived the community with his church and über-fancy preaching. Unfortunately, Perimo is more interested in getting people to do what he tells them to instead of giving them spiritual guidance. Considering one of the major purposes of religion is to provide people answers about death--why do we have to die, where do we go when we die--I thought it was very appropriate to have this as a subplot and a representation of everything that goes wrong in a religion. At the same time, though, I didn't feel like this aspect of the book or Perimo's character were fleshed out very well at all. The conclusion relies on both heavily, but the danger feels overblown and the conclusion way too pat. 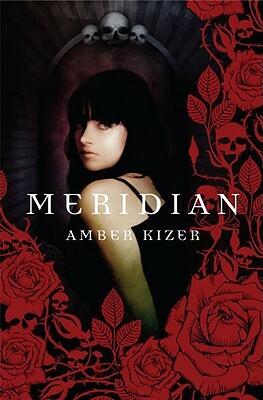 Finally, there's a romantic subplot between Meridian and a boy who is living with her aunt named Tens. It was sweet, but not terribly interesting. I do like Tens' character, though, and perhaps he'll have more of a role in the next book. Overall, this was a very good, quick read, and I will definitely look for the sequel. I can't wait to see what else this author has up her sleeve! Chicago 4.0 by Chloe Neill + Giveaway! Nerds Heart YA: Pure vs In Mike We Trust! The Library, It Was Looted.